Every holiday season the lights, all two or three million of them depending on which source is giving the figures, glow from late November through the end of January. 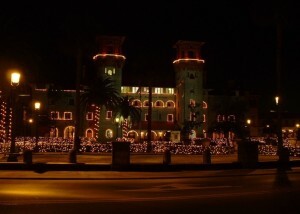 But the tradition of displaying a light in St. Augustine goes much further back in time. During the 250 years of Spanish rule, the citizens of St. Augustine marked the holiday season by displaying a single, lighted white candle in the windows of their homes. Early residents could never imagine what this tradition would be like almost 200 years later. The trees of the main square are covered with strands of miniature glowing white lights. The famous trolleys cruise the streets at night festooned with lights echoing those on the trees. 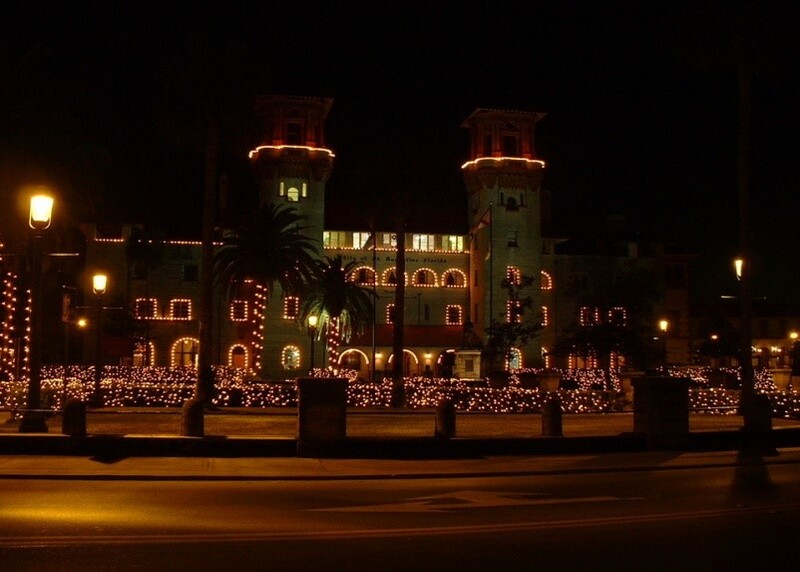 Most buildings in the Historic District, including Flagler College and the Lightner Museum are outlined with thousands of the lights. Twinkling lights spill out to outlying streets with many private home and inns getting into the spirit. Even “Ripley’s Believe It Or Not” castle is literally covered with them. When reconstruction of the Bridge of Lyons is completed, and the bridge is lit up, the spectacle of the holiday lights will be even more spectacular. In addition to being the oldest continually occupied European city in the United States, St. Augustine bills itself as a place of elegance and romance. When Henry Flagler arrived with his railroad, the history of Florida quickly changed. Where Henry went, luxury accommodations were certain to follow. He built the Ponce de Leon Hotel, now Flagler College, here in 1888. It was state of the art for that time and the first public accommodation in Florida to have electricity. Be sure to take a tour of the college to see the Tiffany windows in the student’s dining hall. The windows are insured for more than $36 million. In the Old City, everything is within easy walking distance. AAA named St. Augustine one of America’s “Most Walkable Cities.” The oldest house in the oldest city and the venerable St. Frances Inn, built 1791, are just blocks apart. Pedestrian friendly and a perennial tourist favorite, St. George Street is wall-to-wall old houses and shops. Many are places of historical interest and open to the public. At more than 200 years old, the oldest wooden school house in the United States is a must visit. The extensive choices of places to eat and sleep are some of St. Augustine’s charms. The lack of chain lodgings and restaurants are at first unnoticeable to visitors who are enchanted by the unique B&B’s located throughout the Old City. Since you are on vacation, why not treat yourself to a stay at an elegant St. Augustine B&B? There are motels of all types, but you can stop at a motel anytime. 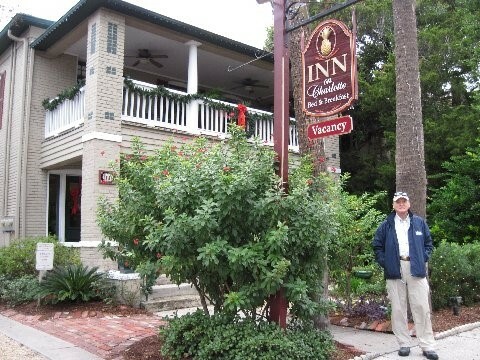 St. Augustine prides itself as being one of the earliest Bed & Breakfast destinations in the country. There are officially 27 B&B’s, all delightful and totally unlike your typical chain motel. There is even an organization called the “Inns of Excellence” which numbers among its members some of the most delightful and interesting properties. The St. Frances Inn was a private residence until it was converted into a lodging in 1845. Today it is the oldest B&B in the Oldest City. Romance is the theme of these inns. The Inn on Charlotte is one of my favorites. With only eight elegantly decorated rooms, all of which feature in-room Jacuzzis, it is small and intimate. Owner and innkeeper Lynn Fairfield personally serves her famous gourmet breakfasts. A delightful break in the day’s activities is the afternoon tea and wine service for guests served with her hot-from-the-oven cookies. At night, charming dining venues of all types are liberally scattered throughout the city. Every type of food is available and one of my favorite restaurants is the Bistro de Lyon on Cathedral Place. It is known as a “chef’s restaurant” and is truly a bistro, not large or impersonal. Chef Jean-Stephane Poinard, a 5th generation chef direct from Lyon, France, creates daily meals based on the selection of the freshest local seafood, herbs and produce. Diners can also chose from the regular carte. His wife Valerie sees to the comfort of her diners, helping with food and wine selections if requested. A city this old is sure to have some interesting tales of apparitions in the old houses. Taking one of the famous and highly entertaining evening “ghost” tours is a must. But there is so much more to enjoy in St. Augustine. There are nature walks, a climb to the top of the lighthouse, boating, fishing, kayaking and art galleries. When the sun goes down, St. Augustine’s night life comes alive.